When Kimmel asked the presidential candidate where he stood on the legalization of marijuana, Sanders discussed the excessive amount of American citizens in prison for marijuana use and emphasized putting an end to the war on drugs. Though Donald Trump abruptly canceled his Jimmy Kimmel Live! 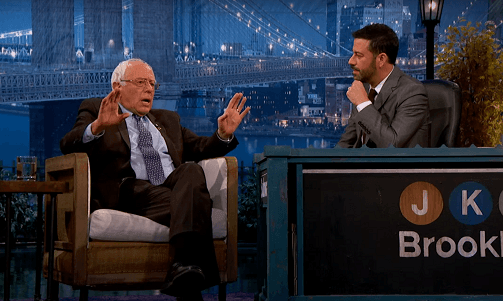 appearance earlier this week, the host still seized an opportunity to speak with a presidential candidate when Brooklyn native Bernie Sanders joined the host on Wednesday night’s episode as Jimmy Kimmel’s weeklong residency at the Brooklyn Academy of Music continues.